Your website is as important as a brick-and-mortar's front display window. It needs to attract shoppers right away, but with the importance of mobile, technology's jumped ahead. Have you? To see if your site is keeping up, we spoke with Mallory Musante and Anna Osgoodby, co-founders of the Web design firm Bold & Pop. In Part 1 of this 2-part series, Musante and Osgoodby discuss what's new in website design, when you should revamp your site and what you should consider when refining your site. Schepp: What's new in website design? Musante/Osgoodby: With the increase in mobile traffic, the biggest change you'll notice is more brands moving toward a responsive design. Instead of users having to enlarge and move the screen around to navigate your website on a mobile device, a responsive design adapts to the different screen sizes of various devices. This provides optimal viewing, and an interactive experience for users through easy reading and navigation. (Scrolling) sites are responsive in nature and also a new trend many brands are moving toward in Web design. This allows companies to provide more information upfront on the home page, so mobile users don't have to attempt to click small buttons or links on their screen to access important information, ultimately leading to easier navigation. Schepp: When should someone consider revamping her site? You're not happy with your current website. If you're not 100 percent happy with your website, what will your customers think? The design is outdated. 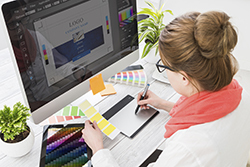 Website design is constantly evolving to adapt to new trends and practices in the business world. Several years ago, a site with flash and animations was popular, but today it is outdated with the increase in clean designs with easy navigation and a focus on user experience. The design isn't responsive. This is a must-have for your website today mainly due to the vast increase in mobile usage. This alone is a good enough reason to revamp your website! [You have] poor search engine rankings, conversion rates, slow load times, etc. Poor results could indicate problems with your website. [You're] ready for a change or rebrand. If you're in the process of rebranding, a new website is a must. Schepp: What should e-commerce businesses consider when honing their websites? User experience: Creating a website that is easy to use and navigate will keep customers from becoming frustrated and bouncing from your website. There should also be a natural flow on the site to help guide customers along the purchasing process. A clean, modern design will allow for a positive user experience that will ultimately lead to more sales. Visual appeal: E-commerce businesses have the ability to capitalize on great visual content to highlight their products. Having high-quality photos and graphics can help elevate your brand to look more professional and trustworthy to customers. Responsive design: This is the most important aspect for any site right now with the increased use of mobile devices. Having a website that automatically adapts to different screen sizes provides easier navigation for customers and allows for a more seamless shopping experience. Schepp: Give us an example of an e-commerce site you've worked on, the challenges presented and how you overcame those. Musante/Osgoodby: We recently helped online jewelry retailer Ash&Willow revamp their website. They were previously using another e-commerce platform for their website, but wanted more flexibility in the design to create a more unique and customized look to match their brand. Schepp: Tell us about your own website, which is eye-catching and appealing. A parallax design: This allows people who visit our site to quickly learn about who we are and what services we offer right away by scrolling down the home page. A blog: Because we are a service-based business, we wanted to create a blog that offers useful information to our audience, whether they're clients or others just looking for advice that can help their business. Freebies: Who doesn't like things that are free? We created this page to provide tools that are not only useful for business owners but also fun! These have also helped provide a look at some of our graphic design abilities as well. By using our bright colors combined with custom graphics and useful information, we've been able to create a site that is not only fun but also helpful for our visitors. Schepp: Thank you, Mallory and Anna! This all sounds great to me but also confusing since I'm Computer illiterate,but I know that most of your readers will get the picture!!! One of my favorite helps on a website is when you pick an item to purchase (put into cart) the site lets you know what other people purchase with this item or (really like the sites that show you parts to purchase now because item has parts that wear out do to normal extended use. Example is different types of shop machines.